Jingle Jam 2018 – $3.3 million! The Yogscast Humble Bundle ran from the 1st to the 31st of December and raised $3.3 million for charity! We couldn’t have been happier to have Murder in the Hotel Lisbon be part of this bundle and help so many good causes. It truly filled our hearts with joy to be able to help so many people in need. Every year The Yogscast runs the Jingle Jam. It is a bundle of videogames where 100% of the proceedings go to charity. New Nerd Monkeys website + blog! More posts incoming, specially one about a new game* UHUU! Meanwhile, we are converting all the old blog posts to this new space, so expect constant updates. Who would have thought… Filipe Duarte Pina and Diogo Vasconcelos are doing a Reddit AMA about Detective Case and Clown Bot latest game, The Express Killer, as well as overall Nerd Monkeys’ related stuff. This feels a little bit weird because we’re so used to answering questions nobody asked us that usually escalates to security “inviting us” to leave the premises. This might actually be an interesting first! Are you as excited as we are? Can you ask us important and relevant questions or will we be bored to death? We are counting on the community to receive lots of interesting questions… and please… pleaaaaase don’t ask us where all the teeth are. TRAILER E3 2018 + JULY 19th LAUNCH DATE! It’s official! The Express Killer arrives on Steam 19th of July! And to start the countdown, here is the E3 2018 trailer! The sequel to the acclaimed Murder in the Hotel Lisbon adventure game is now a reality! Monkeys Stickers by Nerd Monkeys! This summer you can express your feelings using the power of monkeys. Because writing words is for nerds, the team at NM prepared 15 stickers for iOS10, these will help you say those things harder to write with touch screen keyboard. 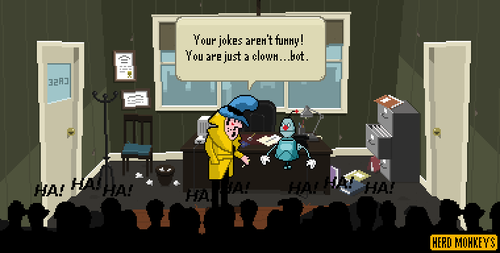 Detective Case and Clown Bot do not like 64bits! In September “Murder in The Hotel Lisbon” will be taken out of Google Play and the App Store. Yeap, these past three years of Detective Case and Clown Bot in your pocket were good but, like everything else, someday it must come to an end. The final date is schedule to the day Apple decides to update their OS exclusively for 64bits apps, we know that 32bits app will no longer be supported around September with the launch of the iPhone 8. Nerd Monkeys is 4 years old today! Each day we have more and more monkeys, it’s getting hard to maintain order in the cage, but we’re getting by. Is it just us or is the studio getting smaller? This was another Monkey Day, a day someone in the team is responsible to show everyone at Nerd Monkeys a list of currently playing games, personal influences or simply interesting/relevant games to play. I’ll finally be able to play a demo for the next adventure of Detective Case and Clown Bot in: The Express Killer! We’ll be at Comic-Con Portugal, cool isn’t it? So now you know. Just visit the Video game Producers area and search for Nerd Monkeys’ table to be among the first people to have a little taste of what the next adventure of the worst detective in the world and his sidekick will be. Today is the 3D artist’s birthday, so we celebrated with a traditional Birthday Chicken Leg in a very fire hazard environment. And yes! We did in fact ate the chicken. The first bald Nerd Monkey has entered the studio! Some say it’s genetics, others point out it’s just another life choice. In any case the amount of shampoo spent is minimal. Another day, another group activity with almost everyone in the team! This time trying out the intriguing Sony PSVR. With the team growing this fast, it’s important we start doing some team building activities, so the studio dinosaurs and the newbies get along, so we did the first Dungeons & Dragons night! Oh my… the fun! Detective Case and Clown Bot in: the Express Killer is the full name of the new episode that we will launch this year and we guarantee at least 30* hours of entertainment! BAM! It’s this year (not last year) that our first DLC gets published. We are working at this moment, YES RIGHT NOW, on a new episode inspired in the classical mystery train murder stories. Something like Agatha Christie’s “The mystery of the blue train”, but like… er… it’s not like that. The episode will be available this year to whoever bought the original game “Murder in the Hotel Lisbon” for Windows, Mac and Linux on Steam. Here Comes A New Monkey! She looks all tough and confident but she is actually very shy and elusive, so pictures of this rare artistic monkey in her natural habitat doing her animations are very rare. Meanwhile, Nerd Monkeys is recruiting! The 2 year anniversary Steam release of Detective Case and Clown Bot in: Murder in The Hotel Lisbon is celebrated with a 75% discount. The Frequently Asked Questions concept doesn’t require much of an explanation as it is pretty much self explanatory. It usually is associated with something extremely boring like a web page full of questions and answers so, for the longest time, we wanted to do something with it, something different. The idea was shelved indefinitely for the past three years and it will probably stay that way forever due to lack of time so I’ll just tell you here since it was the inspiration for the next talk we recently got invited to present. It’s certainly true the great majority of questions we get, either on interviews, events and on our inbox are in a way or another usually the same and… you know… frequent so, around October of 2013 during an interview, we had this crazy stupid idea of creating the FAQ you cards. They would be similar to a business card on one side and the other it would say something like “Congratulations! You won a FAQ you card.” followed by the question and answer and with a footnote with a “Did you also know?”. Plus it could include a completely absurd fact about monkeys, bananas, or whatever. Fortunately our work over the years has been constant, so we never actually got around to to make the FAQ you cards, so why not take this idea and turn it into a fun Q&A? That is what will happen this 25th of May and will later be posted online for everyone to enjoy. Do you have a question for Nerd Monkeys? Games London is a ground breaking new thing to support, grow and promote the games and interactive entertainment sector, so we have to be there! It’s no secret we’re currently working on a few author projects, we even presented what we’re working on last year on the Microsoft Game Dev Camp 2015 event, so the logic step for us was to submit the game to the Games Finance Market in search for interested investors, luckily we were selected so here we go! We’ll also be around the EGX Rezzed as visitors, so if anyone wants to meet just give us a call. Nerd Monkeys is officially 3 years old! Oh my… how time flies. Making games is one hell of a job, but it sure takes its time. While we seem to be not very active on social networks and our own website, in fact we’re always working non stop But this is going to change, starting today we have our official blog, this right here and right now! Since 2013 we changed our workplace three times, two twins were born, the team grew from 3 up to 8, and soon to be more! We launched two author games, one of them got over 115.000 sales, and one app that got first place on the Social category in both AppStore and GooglePlay. For clients we developed two games and consulted for external teams for the development of eight games, some of them very innovative in using hardware like NFC and Bluetooth. Currently we are developing three new author games, three games for clients and 2 consulting projects! So yeah… we have been busy, but we’re hoping to be even more busy by the next year as we keep on growing the team like mad monkeys, until then the Nerd Monkeys team thanks you, yes you! Thank you for all the support and bananas! Under Siege is a RTT game that had a development cost of 1.4M Euros and was released by Seed Studios in June 2nd of 2011 for the PSN on the Playstation 3. Seed Studios was a Portuguese game development studio that unfortunately closed its doors in 2012. This was because Under Siege launch coincided with the infamous PSN hack, a financial blow the company was unable to recover from. Today, on the day Nerd Monkeys celebrates its third anniversary, we officially announce the acquisition of Under Siege intellectual property from Seed Studios to Nerd Monkeys Ltd. There were many reasons that lead us to this investment, those will be revealed in due time. Until then, if you want to try the game you can play the trial available or buy the game on PS3 PSN and if you enjoy it you can also buy the art book available at FNAC. Go ahead… make our game. 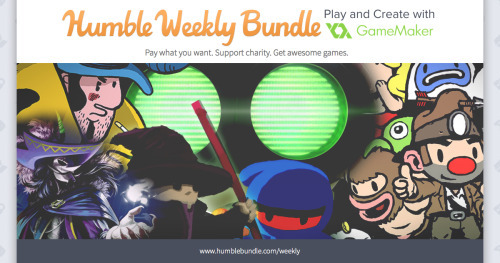 It’s the Humble Weekly Bundle: Play and Create with GameMaker! Humble Weekly Bundle: Play and Create with GameMaker will be exported on Thursday, September 24, 2015 at 11 a.m. Pacific time. Case and Bot go mobile! Nerd Monkeys press kits have arrived! A Nerd Monkeys abriu a Loja Macaca e os primeiros produtos da loja são alguns artigos de merchandise do jogo Crime no Hotel Lisboa. O Pina vai hoje à antena 3 falar do Crime no Hotel Lisboa e está desafiado a dizer na entrevista a palavra “hidromassagem”. Será que ele o faz? Altera Game Jam Games Played. Teaser da reportagem sobre o Altera Game Jam. Murder in The Hotel Lisbon got approved on Steam Greenlight! Terminou agora a pizza night da Microsoft. Foi brutal! Estudo por Nuno Saraiva dos personagens para o jogo gratuito Praxe do Gangue das Capas Negras, clica no link para fazer download do jogo. Da esquerda para a direita: Dux, Putos, Gajus, Brutus e Balofus. Got a great idea for a game but no coding skills? Take part in the 2014 Banana Jam! All game ideas submitted will be voted on in the Banana Jam poll, and the dev team composed of young developers will choose one game pitch from the most voted main genre. The chosen game pitch will then go into production to create a prototype and, if any good, it will pass into alpha production, otherwise another pitch will be selected. If your submission reaches the final alpha version stage, your game will have a strong probability to go into full production and be published by Nerd Monkeys. This means you’ll earn a royalty percentage of its sales! So If you have a great game idea, join in the Banana Jam now! Em breve deverei partilhar todos os detalhes sobre este projecto em que estou a trabalhar, entretanto deixo-vos esta imagem teaser que já circula por alguns sítios. O que achas que será?